I just made my first batch of this! I did some research to decide between Fels-Naptha and Zote and decided to go with the Zote since the ingredient list is readily available. I bought the pink bar since its my favorite color and I thought it would look nice. Beware, it’s pretty soft so it will stick to your grating attachment on the food processer. To combat that I put it in the freezer for a while and grated afterward. Worked like a charm! I mixed everything up and have never been so anxious to do laundry! I’ll let you know how it works soon. Thanks so much for sharing this! I use Zote too. I just grated it with my large hand grater and didn’t grate it into tiny bits. It only takes about 5 minutes to grate it this way. Add some of your soda to your food processor and it won’t stick….that method works great for me! If you cut the Fels-Naptha into chunks and microwave for 2 minutes it removes the waxy stickyness. Then drop the cooled soap puffs into the food processor and they break into nice granulated powder. No sticking on your blades and melts in cold water wash. I grated mine once then again in food processor with borax. It helped it not stick and allowed for smaller particles of ivory soap. Almost like the oxy clean size. Thanks for that tip! I will try that on my next batch! 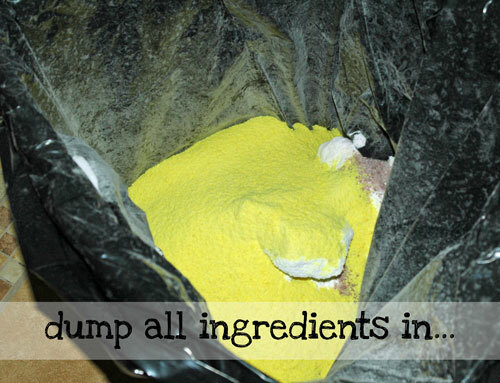 If you cut the Zotes up into chunks and put it in the food processor with some of the borax, it will not clump up. It saves so much time. Grating the soap takes too long. I can make a batch of detergent in 5 minutes. I just found this the other day and cannot wait to try it! I was curious though… Do I need to use fabric softener or dryer sheets or is that unnecessary with this detergent? 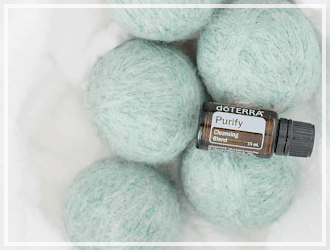 I found a recipe on Pinterest that was harder to make and didn’t require using fabric softener so I wasn’t sure about this one. Most of the time I don’t use a fabric softener unless it’s for towels (what can I say, I am a sucker for super soft towels). So I use Suavitel I think it’s called… or you could use dryer sheets. But honestly I don’t use anything for the other clothes. Sam you can also make a “bean bag” filled with Epsom salt to throw in the dryer. And add essensial oil if you like scent. I use it until the softness runs out, for me a long time, because I like to air dry everthing except towels. I throw jean in for about 10 after they are dry to soften them up. Saves $$ and feels good. Karrie, try not using softener except vinegar for a load of towels against a load with downy ect and see the difference in the absorbancy. this is also true with baby cloth diapers. I will have to try that for sure, thanks! It is recommended that you should not use fabric softener with towels as it reduces the absorbency of the towel. In 30 years I’ve never known that. . . . I don’t add the softener to my towel loads anymore and my towels are lasting much longer. 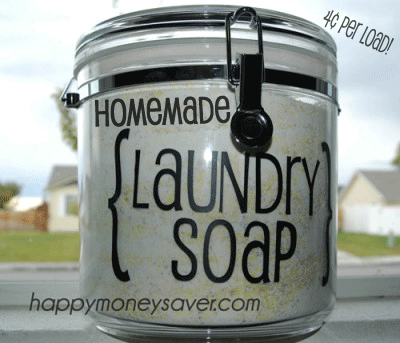 I use homemade laundry detergent without adding softener pellets and my towels still come out “soft”! I used a remnant of a container I had and a fresh one. Thank you I really am tring to save more money and it hard to live on unempoyment and It don’t go far and have not been able to find a job. Thank you and God Bless you.. I have just started researching about making my on laudry soap. Some people say they can make the soap smell like gain it any scent you like. Where do you get the scents? Thank you. The only scent I used was from the purex crystals I used..otherwise it would be nearly fragrance free. I am guessing you could add in some drops of essential oils perhaps? I have heard about using powdered laundry detergent in place of the bar soap. That way it might smell like Gain or Tide or whatever you choose. I haven’t tried it, so I’m not sure how much scent it would have. Gain makes the fabric softener pellets that are like the Downy or Purex ones that you see in the picture. I have one of those from Gain, and in the bottle it smells almost like baby lotion. You could use one of those…I think Gain has at least two scents. (These don’t seem to bother my sensitive skin as much as liquid softeners do depending on the smell). Does it work well with cold water washes? 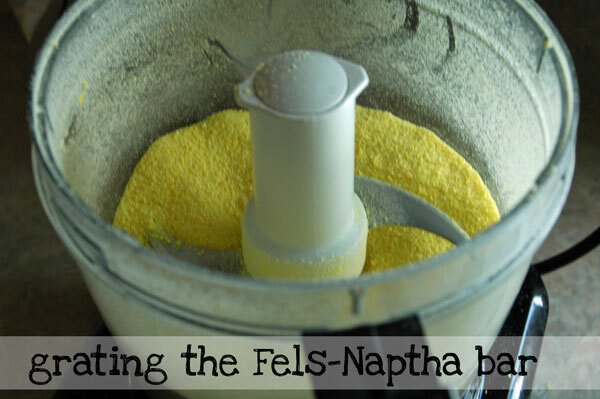 Just thought I would add that I have my local grocery store order Fels-Naptha soap by the case for me. It is quite a bit cheaper this way. I make a huge batch of detergent, using the whole case of soap. I like that I don’t have to think about running out for a long time. Great thinking Michele! Stocking up and doing a huge batch would be a great time saver. Hi Pamela B. 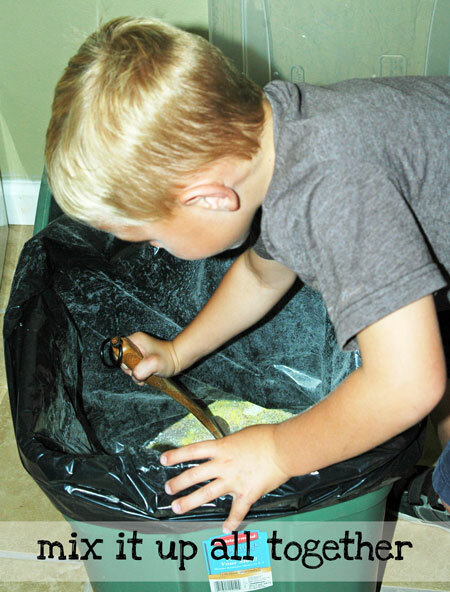 – In my picture I used the rest of my 3 lb container which was only about 1/2 full, so I used the 1.3 lb size. I think if you are at a stage with a lot of stains happening for your clothes to use the larger, but if I don’t have babies or toddlers so the 1.3 lb size worked best for me. So did you use just the 1.3 lb container of Oxi-Clean or the 3 lbs of Oxi-Clean for the recipe? how does this stack up to the homemade liquid detergent? i have used it for a while now but it doesnt get our clothes very clean. I absolutely love the powder detergent compared to the liquid. The liquid is more of a hassle to make and I agree about it not getting the clothes as clean. I use more detergent when I use the liquid so I am not sure if it is cost efficient or not. However with the powered detergent recipe from above I have been using it for 2 months now and love it. I use 2 tbls the clothes smell great and the stains come out well. A big plus for me is that my 6 year old’s rash has gone away and we had tried everything from dreft to hypoallergenic everything and it never went away. Hope this helps anyone hesitating about trying this. i agree , don’t care for the hassle of the liquid , but i love,love,love this recipe it makes everything smell great, i use downy unstoppables cause i get tons of coupons and kroger always has sales for downey where i live , and instead of oxy clean i use finish dish washer detergent , i know it weird but it works so great i never even pretreat our stuff anymore , this gets out any stain we have ran across even red wine ! love it!! Finish dishwasher detergent??? Is that an oxygen bleach? Wow. I have to google that one. If you’ve ever read the oxyclean label you’ll see a bit that says you shouldn’t mix it with water and cap the bottle for a long period of time. Oxyclean starts to react when mixed with water, so it becomes less potent as time goes by. I think I’ll stick with the powdered recipe. I used to use the liquid and my clothes were getting dingy. I switched to this recipe (one difference… my recipe calls for 2 containers of OxyClean) and my clothes sparkle!! I love this recipe, and the Purex Crystals make it smell so nice! I would like to try this but I was wondering when you wash your whites can you add bleach to the homemade detergent? Yep, I just add bleach to the beach section of my washer. You can, or for a more natural approach, you could add a cup of hydrogen peroxide. It gets your clothes clean and white without the hazards of bleach and it doesn’t weaken the fibers of the clothing (thereby making you replace them less often) as bleach does. I think this works MUCH better than bleach and is better for the environment as well. I have very iron-rich well water and even with a water softener and filter, I get iron stains on everything. Since I have been using this, my whites have looked so much better. I think the bleach might have actually made the iron stain even more than using nothing at all. Is that possible??? Do you think hydrogen peroxide is a better whitener than the biokleen? My 6 year old has white uniform polo shirts. Ugh…yes white of all colors and they can’t have any stains or I have to replace them. There is a warning on the side of the Oxy Clean container that warns against mixing with bleach. My husband actually pointed that out. I agree. I wouldn’t mix bleach with this recipe . You already have a whitener in the mix..the oxi-clean. Thank you for this recipe, you have given me another trick to save my family money. I would like to add that it is not safe to add bleach to the wash with this recipe, I have found the following comments listed previously on another website…”Chlorine bleach and Oxyclean (powdered hydrogen peroxide, called sodium percarbonate) should never be mixed together, it forms hydrochloric acid, a very corrosive mineral acid”. If you are planning to add Oxyclean, DO NOT ADD BLEACH. Another word of caution – (recipe without Oxyclean added) if you decide you are going to add vinegar to your rinse water, please DO NOT use chlorine bleach in the wash. The combination produces a deadly gas and can kill. Even though it’s down the drain, it’s still in the clothes and it’s lurking in the drain. Please be careful when rinsing with vinegar and washing with chlorine bleach. Also, I’ve been reading that this recipe may cause colors to fade, my guess is that they have not mixed the ingredients together well enough & are getting too much of the Oxyclean in with their load of laundry. Do yourself a favor and periodically remix ingredients before filling your container. 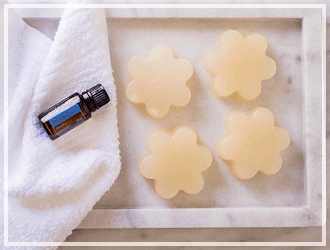 Finally, the recipe works best with soft water, the harder your water is, the less this soap or a store bought detergent cleans. I found this recipe on Pinterest and decided to try it out when I finally ran out of my stocked up laundry detergent and have to admit I LOVE IT! I have a front loading HE washer as well and it works great even with just grating the soap. You can also use Zote soap and I think it’s a little cheaper than the Fels-Naptha. I used to go thru a lot of soap having boys who do the laundry but this is so nice cause I just put the teaspoon measuring spoon in and you’d think they were baking cause they make sure it’s exact 🙂 I have super sensitive skin and this works great and doesn’t bother me at all. I also make my own fabric softener, dish soap, and household cleaners from recipes I’ve found on Pinterest and it’s amazing how much less I spend even if I don’t get to use coupons all the time. 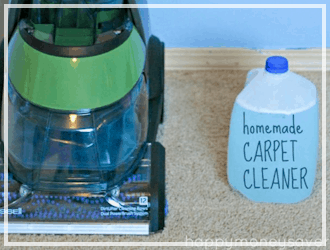 Just add vinegar to your clothes for a less chemical easy fabric softener fix. It doesn’t make your clothes smell like vinegar. Once they’re dry you’d never know! Does the vinegar also keep the static out of dried clothes? I’m curious what would be a homemade product to take care of static. When do you add the white vinegar when washing clothes? And how much? Use the vinegar in the rinse cycle. Make sure it’s white vinegar! For my fabric softener I use one part vinegar to one part water in a two liter pop bottle. I also use that little bit of conditioner thats left in the bottle from washing your hair for scent 🙂 Just add water, shake it up, and pour it in the pop bottle as part of the water that you add to the vinegar. I’ve been doing it for a few months now and my clothes are soft and smell minty (because my conditioner was Organix in the green bottle). Sadly, I switched to the no-poo method a few months ago and won’t be buying conditioner anymore. I need to come up with a new recipe! Please consider using Fels Naptha instead of Zote. Zote is imported whereas Fels Naptha is Made In the USA (creating jobs in the US)! The price difference between the two is neglibile when you take into account the Zote has a much higher water content. I had to add an additional 1/2 box each of Washing Soda and Borax to the recipe due to our water down where I live. I have been using this recipe for several months now… I love it!! I like it better than tide… I think my clothes come out looking way better! I don’t use Purex, but I do run a rinse cycle with vinegar, and my laundry looks great. And, the vinegar rinses out anything my family might be allergic to… we have some sensitive skin issues in my home. Forgot to mention I also make my own dishwasher soap, super simple recipe with almost the same ingredients as the laundry soap; vinegar, washing soda, borax, and salt. Would you share the dishwasher soap recipe? I’ve been making my own laundry soap for a couple of years now, I love the fact that this recipe is dry as mine is always liquid. I only use three ingredients; Ivory soap (because it’s whats I can always get for free with coupons), washing soda and borax I usually spend at most $8 dollars and with the above ingredients I can get about a year worth of laundry soap. I love making it, and once you learn how to make it, it doesn’t take long at all to make! Woo hoo – that would even be less expensive than my recipe, nice! I have been wondering about dishwasher soap too, awesome! The kool aid contains citric acid that helps to remove powdery deposits and water spots on the dishes. White vinegar in the “jet dry” compartment also helps. I’ve been making the liquid version with less ingredients in it for about 3 years, it works GREAT. You just grate the fels-naptha, melt in 4c of water. Fill 5 gal bucket half way with HOT tap water, dump in fels once it’s all melted, 1c broax, 1 c super washing soda fill rest of the way with HOT tap water. Fill any smaller laundry container that’s empty half way, then fill with water, shake and VIOLA. Less ingredients, fast, easy and CHEAP. Costs me around $13 per year on average. Awesome Kala! I have yet to try a liquid version, but I just might have to someday. Thanks for sharing your recipe. 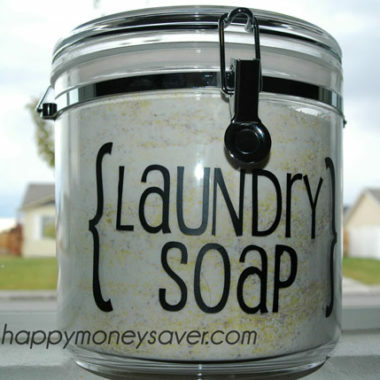 When you put your solution in an empty laundry container, how much of the soap do you use? Do you use the measuring cup that comes with the original laundry soap container and follow the amount scribed on the measuring cup? I’ve used the liquid and it’s great, but it’s really messy and you have to stir or shake before each load, my daughter keeps a 5 gallon bucket full and siphons it into a small jug and that works, but I’m excited to try the power! thanks!! Lynn, I use the liquid form also and it sounds the same as Kala’s. I use a half cup each load and it works great! Though, I am planning on trying Karrie’s powder recipe now, too. I found the scoop that comes in the Oxy-Clean is 2 tablespoons and the lid on the Purex top line is 2tablespoons. 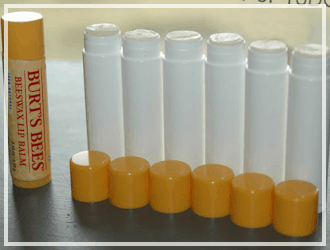 How much of the liquid dpo you use per load? Do you have a HE frontloader? I read the liquid works best in those because powder will remain and sometimes “cake up” in the detergent holder. So I have always used liquid. Do you have this problem with this recipe? I would love to do this. And all you need for HE’s is 2 Tbs, 3 at the most. I like that you try things out before posting them and broke down the math for us too!! Hi Heidi, Yes I have a HE frontloader. I removed the little cup thingie for liquid (read the manual on that one..ha ha) so that I could use powder. Its been working perfectly fine for me. 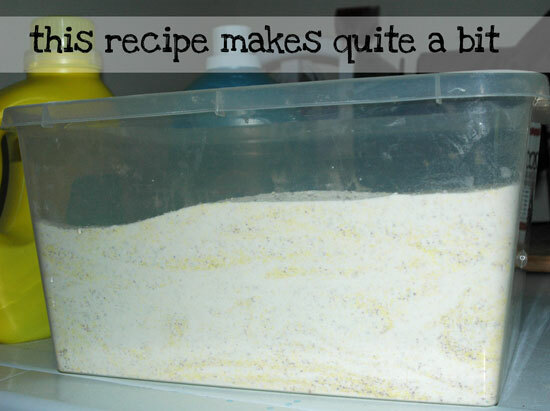 I use 1-2 tablespoons of this detergent max with this recipe, you just don’t need too much of this detergent. A little goes a long way. So for an HE frontloader, do you put the powder in with the clothes, or in where you normally would pour the liquid soap? I just made a batch of liquid degergent but my husband doesn’t like it. I used the recipe that uses Fels Naptha, Borax and Super washing soda. Could I just add some oxy clean to it? Hi Kelly, I have a HE frontloader and I removed the little cup thingie (super scientific, right? 🙂 ) for liquid so that I could use powder. It’s been working perfectly fine for me. I have never added Oxyclean to a liquid detergent recipe after it has been mixed but I think it would be worth a try! I make the liquid like it.It takes up a lot of space. when using Oxy-Clean that I added after adding the melted soap and borax and washing soda it erupted. i got burned and had a horrible mess to clean up will try this powder one though. I couldn’t comment on the August 14, 2013, Homemade Dishwasher Detergent Recipe, that you made. So, I thought I would try here. It leaves a cloudy film on some of my silverware – not all of it. Everything else is great. I use the vinegar as the rinse ad. Any other suggestions – did you have this problem? I have a front loader and I put the soap in with the clothes. I have not been using the soap dispenser, I can but I just put the soap right in with the clothes. I put my soap in with the clothes also. I read that soap accumulates in the dispenser and you have to clean it regularily. I don’t want to do that so I don’t use the dispenser for soap. I have a problem with grease stains on my Moms slacks, the grease is some sort of medical ointment the nursing home uses on her skin. I’m going to try the Dawn/Peroxxide mixture, I hope it works. If anyone has any better idea let me know. I tried soaking in oxi-clean and I tried a stain remover, and clorox. I’ve probably set the stains in. Dawn is the best grease remover I’ve tried, never mixed it with Peroxide, just rubbed it in and let it set for a few minutes before throwing it in the wash. I have been using this recipe for nearly a year now. One batch keeps my family’s (there are 6 of us, and 3 are teenagers) laundry clean for about 5 months. I have a front loader too, but only use about 1 tablespoon per load and it never cakes up. I was worried about that also, but it has never happened. The great thing about this soap is this: It gets rid of hard-to-get out odors too, like cat pee and the grease and coal dust my husband comes home from work with. I have NEVER seen Tide get rid of cat pee smell (unfortunately, when we moved, one of my cats began peeing on my daughter’s things). 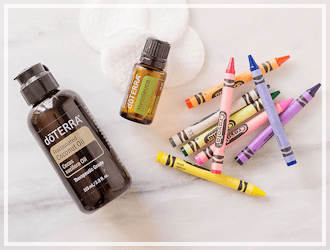 I am sure my kids use more than they are supposed to use, but even considering that, it is much cheaper for me to make this than to buy branded detergent. okay I have made the laundry detergent today. Do it suppose to make suds? Hi. I’m using this recipe for the 1st time today & noticed that my water turnes grayish. Is that just the dirt from the clothes? I am not sure what that is. That has never happened to me before. Hopefully it was just getting those clothes clean! As My grandmother always said, If a detergent is making suds, its not cleaning. It just making suds! No, this does not produce any suds but is super effective at cleaning so don’t worry that you don’t see any suds! I have a front loader, and what I do (my hard water doesn’t like liquids very much) is when I use powder, I put the powder in, then the clothes. There is no residue in the holder, and none in the washer itself. The borax and washing soda will clean the drain hose as well from buildup from other detergents (at least it did mine). I have sensitivities to the optical brighteners in some detergents, so I either have to use free and clear detergent or make my own. This is close to what I’ve done in the past, but I didn’t think to add the fabric softener pellets. How you make the liquid ??? 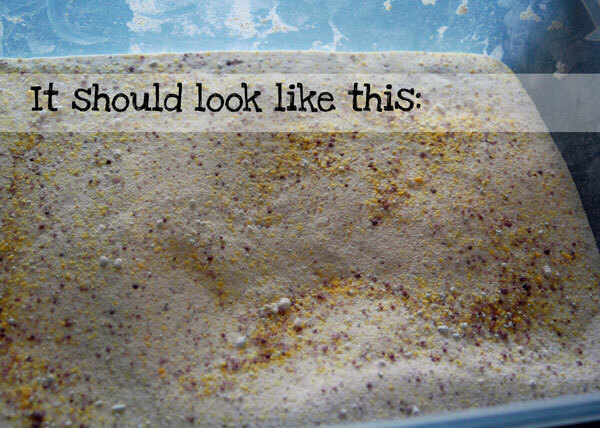 This is a great way to make washing powders I love it but there is an easy way for those who like the liquid instead of powder. You grate the soap put it in a pan of water cook on medium until it is all melted then have a bucket or large container filled with about 2 to 2 and a half gallons of water add the soap then add the other products stir well and let it sit for about 12 hours give or take and it will turn into a gel you can just scoop right out of the container or put in your own bottles. It works either way I for one will not go back to buying washing powders thank you for putting this recipe on here hope this helps. I have a frontloader and it dissolves great…. You can just put it in the drum along with your clothes, works just as well. It’s pretty decent at getting out stains. When making homemade laundry detergent stick with name brand stuff no generic type names. I’ve been making the powder type and I love it just add a box of your favorite tide or gain laundry soap to it for extra cleaning power. My clothes are always clean, it might be your water. I think tide makes clothes dingy, Persil is the best on whites. I turned this from good laundry detergent to great laundry detergent by adding a 4.5 pound box of powdered TSP (not TSP substitute) that you buy from paint stores, or Amazon. Yes, I know phosphates were banned for home use laundry detergents, but they are still put in commercial laundry and dishwasher detergents. I’m just adding back the super ingredient that a hospital, motel and restaurant is still allowed to use. You realize that using phosphates can lead to harmful algae blooms right? There laws being passed to ban phosphates in all detergents. Please don’t be ignorant. These days, when our environment is increasingly fragile because of ignorance, complacency, apathy or malicious actions, there is no excuse to use a substance that further damages our environment. If you didn’t know before, you do now. Please stop using phosphates. Marine life needs clean water and we all need safe drinking water. I buy an extra bar of Fels Naptha to use in removing stubborn stains. Just wet the area and scrub with the bar. Let it sit for up to 15 minutes then throw in the load. It works better than any other stain remover I’ve used, even grease! For very tough stains, you can mix one part blue down soap, one part baking soda and one part hydrogen peroxide, rub it on the stain both sides and let it sit for a couple of hours before washing it! It works wonders! What is “blue down” soap? Never heard of it and where do I buy it? Borax is the main ingredient for me. A navy man thanked me for removing all the dirt stains. Borax removes stains, smells and cleans well without removing the color of your clothes. I always add 1/4 cup to my load. And Borax does no harm. Yes, it’ll work better than anything on the market for removing stains. For very soiled clothes, fill the washer up and let them soak an hour before washing them. (Just push the knob in to stop the washing process. Pull it back out to start it again.) PS: If things are very soiled, smelly or stained you can also pour 1/2 a cup of household ammonia in that soak. You won’t even need a softer if you make it with the smelly crystals. The baking soda softens as it cleans your clothes. I have been making this for a while. Tweaked it a bit as I had found other recipes. I use 2 boxes washing soda, 1 3# box of biz, Epsom salts, 3-4 bars of zote and essential oils in the salts ( a tip I saw instead of using purex crystals). I spend just under $20 and get 256 loads (approx). 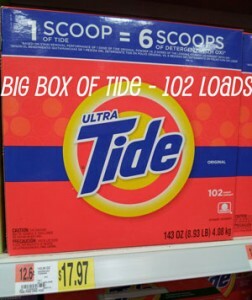 I figured it about .07 a load which still beats the .13 for Tide in my area. Mostly I like that I know the ingredients. Thanks for letting me share. How much Epsom salt do you add? What is the benefit. I’m always working on getting arm pit odor out of clothes and find it difficult. My daughter-in-law soaks their workout clothes in vinegar to make sure sweaty smells are gone. Just be sure you DO NOT USE CHLORINE BLEACH if you use ammonia. The two mixed makes a deadly gas! 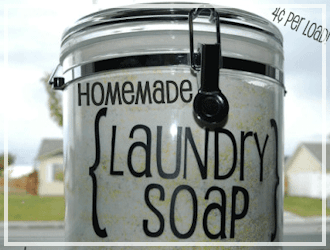 I have made the laundry soap 3 times, I enjoy hanging clothes outside in the summer. I cannot imagine using anything else. I handle all our clothes, this recipe really gets clothes looking great, gets out stains. I even give my laundry soap as gifts, and I give the recipe with it! That is a great idea to use it for gifts! Great to give to college students, as gifts! Yes, that is a great gift for college students! I would invest in a stain remover if you are worried about stains. I have 2 small children and have tried just rubbing the fels naptha bar soap on the damp stain before washing with this soap and was disappointed in the outcome. Baby food stains disappear when clothes are soaked overnight in Biz before washing. I have children and have used this recipe for a while. You may want to invest in a stain remover. Use dawn soap. It takes out even shop grease. I made this today and it actually cost me MORE to make than to buy at the store. I’m in Canada so some things are alot more than what was priced up top BUT I LOVE that its natural there are no detergents or artifical whatever they put in the regular detergent. I also put essential oils in it to give it a nice scent. Wish me luck.. Gonna try it right now. I know this is gonna sound a little silly, BUT one of the best and gentlest ways to get the stains out of the baby clothes, especially those formula stains, is to BOIL the clothes. I have saved so many shirts by doing this…even when i thought all was lost. You don’t need to add ANYTHING to the boiling water, it works wonders. My friend is from Great Britain and its something her Mother used to do, once i tried it, i was hooked!! And again, its super safe and gentle. I still put it through a wash cycle afterwards but it took out each and every stain, including old ones! I lived in France for nearly 7 years. All European washing machines are front loaders and they heat their own water, up to boiling if you specify. I don’t think I ever used the boil feature but I did notice that the clothes came out very clean, unlock American washers (top loaders). So I heartily recommend the boiling method for tough stains. Also, now that front load washers are becoming available in the US (I got mine at Lowes for half off, due to some dent somewhere…) I recommend investing in one of these too. My clothes do come out cleaner. For stains I use Zout. It works even on stains that have been “set” by a previous wash and dry. I agree clothes in Europe comes out cleaner because all washers heat their own water with can be regulated up to 90 C . Also washer cycles are much longer for a normal setting. When I go back home my sister removes stains from my clothes that I thought could never be removed. PS front loaders have been available in the US for decades, I bought my first one in 2002 at Lowes on line. I also think the water hardness and composition makes a huge difference. In the US public waters have fluoride added in many areas. And last….water hardness level…..now there are variation of this in different areas of EU but I think that all these differences make noticeable results in how clean laundry comes out. I don’t mean to sound snarky if I end up sounding like that, but .035 cents a load for liquid soap sounds good. I just question how much you had of that and how much you would need to buy yearly and how often that sale is. -shrugs- I rather make this and save lots more money. Wow! Hey I don’t shop @ Wal Mart!. . . . . Unlike ‘I don’t like to shop at Walmart either’, I don’t mind sounding “snarky” since you already set the tone . . . So I guess you either have more money than the rest of us OR you just don’t want what money you have for anything in particular or for anything special. . . Personally, I’ll take .04/load over .035/load ANYTIME! But hey, that’s just me! >BIG SHRUG< and as for any "…extra work needed. ", I think Karrie pretty much already took care of the "heavy lifting" for us! 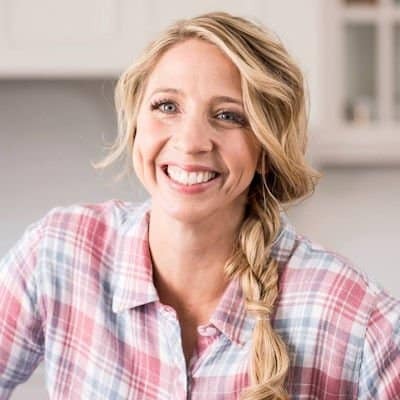 Here's where I WILL make a genuine apology, IF I'm wrong, but I have this feeling that anyone who would be SO RUDE to the hostess while "visiting her house" by making such a comment is probably just to lazy to do the "extra work" in order to save any money! My truest and deepest apologies if I have offended anyone with my remarks. You do realize that .040 is more than .035. Consequently, .04 is .005 more than .035 per load. I personally choose to make my own detergent because I appreciate that less plastic packaging is wasted and it is worth the extra 5 thousandths of a penny to me. I skip the downy scent things for the same reason. Also, Wal-Mart isn’t the only place to buy this stuff. My locally owned grocer keeps these things in stock for about the same price. I buy by the case and save even more. When you shop locally, you can often make friends with the staff and they are always happy to pass bulk savings on! Why would you take 4 cents per load over 3.5 cents per load any day? That doesn’t make any sense. As another person stated, .04 is higher than .035. Plus, we know exactly what’s in it! In general, I wouldn’t. The great thing about this recipe is that it is consistently inexpensive, no sale needed. The BEST thing about this recipe is that my very sensitive-skinned family does not react to it. As a bonus, they love the way it smells when I make it with ZOTE. I can’t afford to use whatever detergent is on sale as everything but Tide makes my husband’s eczema flare up; I really can’t afford to have him spend another week in the Cleveland Clinic because of his eczema. If we all had normal skin, I’d stock up on the cheapest (effective) detergent every time I found a great sale like the one Jen mentioned. AND let’s not forget… the laundry soap recipe listed here simply works better. In my opinion. They are all wrong the price stated was $0.035 not 3.5¢ and $0.035 doesn’t make the price 3.5¢. If they made $0.035 into 3.5 that is how you make $0.035 into a percentage so that would be 3.5% not ¢. When you move the decimal 2 places to the right you make your number a percentage. Shelly, $0.035 is $0.040 or 4¢. Reason is, retailers like trying to sucker consumers into thinking a product is cheaper than the other buy labeling them in this way, ($0.035). But, when you get to that register the price, (without tax), is going to be $0.04 or 4¢ or $0.040. Reason is, all retailers, in school math, in $0.040 you can not round the 4 up because 0 is lower than 5, so 4 stays the same making it $0.04 or 4¢. In the # $0.035 the 3 can round up to 4 because the # behind it is five or higher, making 3 round to 4. Therefore, making the price $0.035, actually being $0.04 or 4¢. But with the Arm & Hammer at RA, you should also look to see what size is it and how many loads you will get from it too, because even though its the same price as this homade detergent, I honestly believe the arm n hammer is way more expensive only because this homade detergent is 18 ponds for 504 loads. 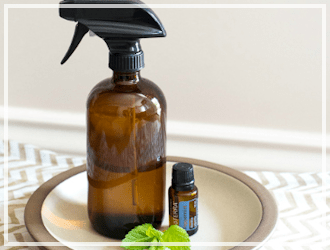 Not only that all you have to use is 1-2 Tablespoons! It sounds like you are easily offended. Karrie seemed to be able to ignore the comment and it was directed at her! And, yes, she puts a lot of time into her blog, but by the looks of the ads on her site, she make a tidy profit. At any rate, maybe the best course of action wouuld be to not stir the pot. But of course, that’s just me. i’ve been using this recipe for a year now. but in mine i use 4 bars of Fels-Naptha not 3. and works in my opinion better than most soaps. and its mostly for sensitive skin for my daughter and scent free for my clients. i work in a spa. but here’s the kicker it cost me 25.00 to make it and lasted 11 months. it saved me roughly 210.00 that’s not including taxes. thats based on the price of the soap i was buying and how many loads a month i was doing. hmmmm….. yea i’ll grind the bars. I also have a spray bottle of 3parts peroxide and 1part water I spray tough stains with let it sit for a bit then through in wash it doesn’t hurt coloring on any clothes and this mixture here I used at my Aunts while visiting her and oh my goodness did it smell wonderful and cleaned as well as brightend our clothes now I am going to make some. I use two parts blue Dawn dish soap with one part hydrogen peroxide, and that seemed to work better on the greasy stains my two and four year old sons bless me with! I’ve been very happy with it. I’m gonna film my how to video on this stuff. I use the 2:1 Ratio of Non-Concentrated Dawn and Hydrogen Peroxide, but I’ll only use three ounces of the Ultra Dawn since it’s twice concentrated and 16 ounces exactly of Peroxide. I’m also thinking of dissolving the detergent in boiling water before putting it in the washer and see what happens whenever I make it since my buddy Jerry always uses hot water when it comes to OxiClean. He taught me a few tricks with OxiClean if I were to use it in a multi-surface cleaning formula. Applause & standing ovation! I couldnt have said it any better. Good girl,I’m with you 100%. I have a lot better places I can spend money than on laundry detergent. $.035 cents is three and a half cents, which is cheaper than $.04 which is four cents. And no work involved. I would buy it at that price but I’ve been making my own for almost 5 years, as well. Look on the bright side of things here, at least you KNOW what’s in this..
Ok.. so know what’s in it. Um, read the labels on everything. that includes everything. And, have you read the ingredients/labels/warnings on the items you use in this? And, to be a downer.. I would not prep this stuff without using a mask or some form of respirator. Much less allow a small child to mix it up not wearing stuff. Caustic = bad juju when ingested.. orally, or through the lungs. How do I know this? my grandpa died of bakers lung. Good ole flour. I will give this one a try, but will def. use protection for my lungs. I like being alive too much. 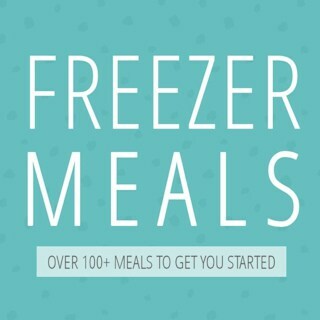 I love this recipe it lasts us a year and it really cleans are clothes. We do alot of laudry too. You can buy ingredients at Ingle’s or any grocery store , Target has some ingredients too. 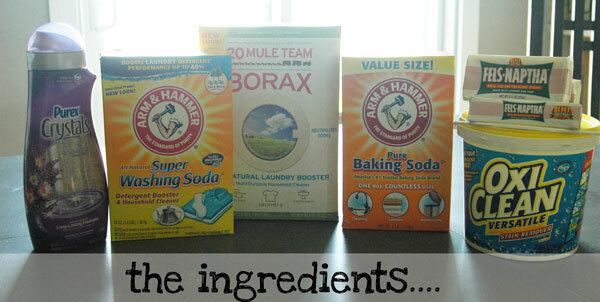 Arm & Hammer laundry detergents have bad ratings because of chemicals. That’s what we are trying to steer clear of. I use Zote Flakes instead of bar soaps. It is available at Walmart Grocery Store on 4th st in Moore, Ok. It is so much easier . I refuse to shop at Walmart, but I have a front load washer, can I use the recipe and pour a bit of spring water to washer it down the hole? Actually everyone…$0.035 would be $0.040. Let’s go back to elementary school. Yes, there is an infinite amount of 0’s that we do not write. But, when you write it the way it is written, $0.035 or $0.040, we are taught to round as grocers do when this is the outcome. You can’t round $0.040 to anything because of the 0 behind the 4 so 4 stays 4 then written as $0.04 or 4¢. Now you round the 3, in $0.035, to 4 because the number behind the 3 is five or higher, therefore you round 3 up making it $0.04 being the price. Grocers may label it as $0.035 to make it seem as if its less too sucker you into buying it. Just as their coupons do. Well most of them. Tiffany, the $0.035 is the calculated cost per load and has nothing to do with the grocer pricing. When comparing the cost per load, as we are doing here, there is no rounding. The math is being distorted for this problem, because you are NOT buying the detergent one load’s worth at a time. If you were, the 3 and 1/2 cents per load would indeed be rounded off to 4 cents per load but you are not. As an example, if you pay $7.00 for enough detergent to wash 200 loads you are paying .035 per load: you are not paying $8.00 which would be .04 per load. You could buy ingredients anywhere. Lol but if throwing your money down the drain doesn’t matter to you why bother reading her post or writing a comment. Instead of putting negativity into a beautiful blog you could be making something productive. Just stumbled upon this website to make my own dishwashing soap since I was sick and did not want to go to the store. I used borax a 1/4 or more in the bottom of dishwasher and it worked, but around the 5 time it did not so I am here. I also notice your little boy dipping into the tub of soap and read somewhere that Borax should not be touch by men or boys it can make them have problems with fertitily. Not sure if it is true but I hate to see anything happen to beautiful children. I am trying the new dishwashing recipe today and will let you know how it works. I’ve used a&h before and while it seems to work great at first, after several washes in it clothes start to smell. I think it has some residue that isnt washing out? I’ve been making homemade detergent for 4 years, the 5 minutes of time is far easier on the wallet and time than having to schlep to the store for detergent haha.